On May 16 Stanislav Kouba, a director of the Income Tax Department, Ministry of Finance discussed the Income Tax Act and future tax policy with Peter Chrenko, Partner at PwC and the American Chamber of Commerce members at AmCham roundtable. 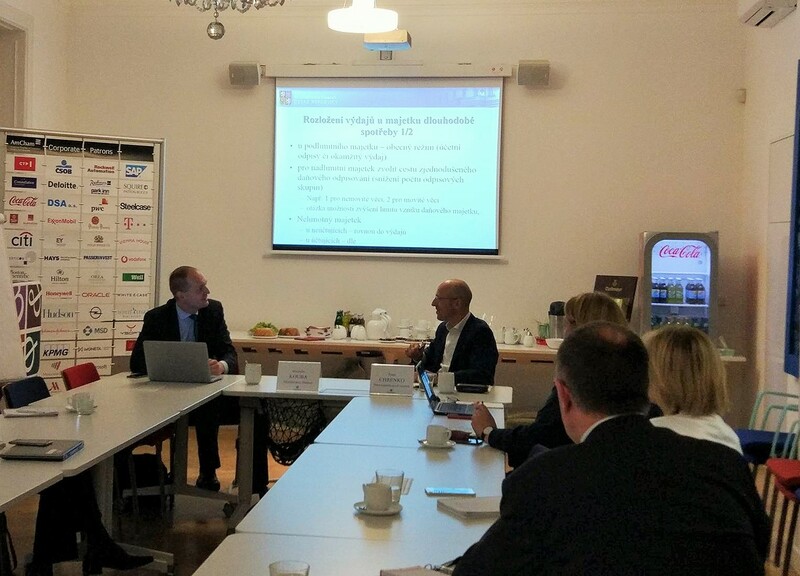 The American Chamber of Commerce in the Czech Republichosted a discussion roundtable on tax policy with Stanislav Kouba who presented plans on a tax policy, particularly the Income Tax Act. Mr Kouba stressed that the government does not plan to raise taxes, however, given the rather expansive fiscal policy, emphasis is placed on the increased intensity of tax collection under current legislation. Implementation of the new Income Tax Act is dependent on priorities of the next government. Nevertheless, the key systematic changes will be part of the future legislation development without the respect of its form. That means that IFRS (International Financial Reporting Standards) should be a part of this future legislation development, as well as electronization of tax system, implementing of international agreements on digital taxation or comprehensive recodification of tax assets which should lead to e.g. simplification from the existing 6 depreciation groups. “There are two approaches to the digital taxation, a long-term one which should introduce a concept of a virtual permanent establishment as well as mechanism on profit division, and a short-term approach which plans to follow European Commission proposed directive – a turnover tax for particular digital services.” says Mr Kouba.